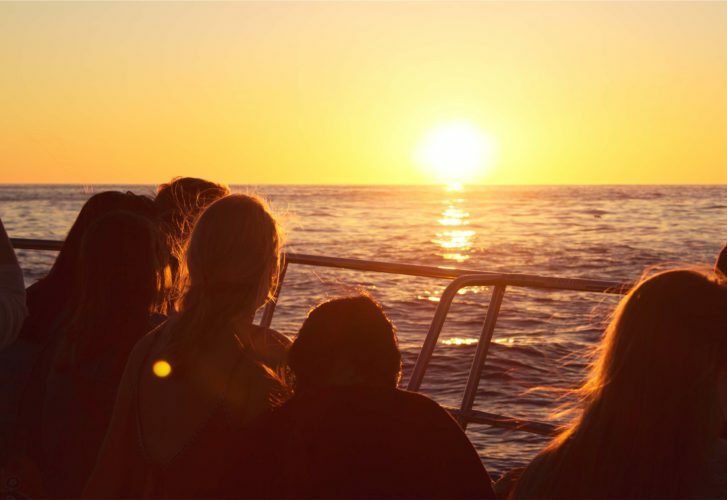 Have you ever thought about taking a sunset cruise in Cape Town? If you’re like many other people, you’ve probably discounted the idea as something that is only an option for the super affluent and well-off. Not so. You can definitely afford this luxurious experience, and afford to enjoy it with your friends and family. Enjoy our sunset cruise, which takes you straight to Clifton 4th Beach or, depending on the weather on the day, to Table Bay. Once we reach the destination, you get to enjoy and take in the beautiful view, while sipping on a glass of Méthode Cap Classique sparkling wine. Honestly, take a moment and consider the fact that people around the world save their money for an entire year in order to enjoy this world-class view for a couple of weeks a year. After this, we slowly cruise back as the sun sets and the city lights up. It is a celebrated experience with Table Mountain and the 12 Apostles completing the exquisite backdrop. This is definitely the cruise of choice for those who are more romantic at heart. We look forward to welcoming you aboard and making your sunset cruise one for the record books. Let us help you realise this dream, and make the experience even more special than you could’ve dreamed about. Why Take Sunset Cruises with Tigger 2? We have been in operation for more than 19 years, and we offer an upmarket concept of cruising along the shores of the Cape Peninsula in luxurious comfort and style. Enjoy your sunset cruise aboard our state-of-the-art vessel, the Tigger 2 Royale. It is a 55-foot luxury Power Catamaran that was launched in November 2008, and she is currently the flagship of the charter boat industry in the V&A Waterfront with her stunningly streamlined exterior and plush white leather interior. The Tigger 2 Royale can cater for up to 65 guests, and has hosted many celebrity status clients since being launched. She also caters for individuals, corporates and special functions, including weddings. You are in for the best cruising experience available in Cape Town when booking your sunset cruise or any other cruse experience with us. We are happy to host guests on any of our regular cruises, but are also always available to discuss personalised and private charters that are tailored to suit the client’s specific needs. In fact, it is one of the aspects that we pride ourselves on, along with the fact that we offer the best personal service on all our cruises. All departures are from the T-jetty in front of the Hildebrand Restaurant at the Victoria & Albert Waterfront in Cape Town. Our route options are therefore departing from the V&A Waterfront, and cruising past Mouille Point, Green Point, Sea Point, Bantry Bay, Clifton 4th Beach, Camps Bay or Table Bay, all depending on the weather on the day. To book your sunset cruise well in advance and avoid disappointment, speak to our team of professional reservationists today. We look forward to welcoming you aboard.